The Candian Lynx is a species of lynx known by the scientific name Lynx canadensis. They tend to only stay in very dense populated tree areas. They are very much unlike other lynx and are equipped with lots of fur and extremely big feet because of the region they live in. They like to prey on Snowshoe Hares. Snowshoe Hairs are a very big reasoning to the way they populate and move. 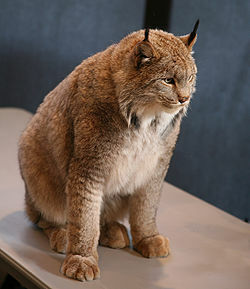 The canadian lynx depends on the Snowshoe Hair They live in the Canadian Range and range all the up to Montana. They reproduce about twice a year and are one of the smallest of all the lynx. The Canadian Lynx has short triangular ears with point like fur coming off the tips. They range between 2-4 feet tall and have very thick bodies. They are some of the smallest cats. They have short stubby tails. There fur is about 2cm long. There fur is Dark grey to yellowish brown and they have a white belly. They also have fur around there face. They have very large furry feet. This helps them in the snowy terrain like a snow shoe does for a human. Its very hard to identify the Canadian Lynx compared to other Lynx besides the fact that of there region. They have hardly any identification marks. The Canadian Lynx tends to breed March Through April. They are normally pregnant up to 64 days. They normally have up to 6 cubs. The average female can have about 2 litters a year. The cubs stay with their mom until the mom is ready to reproduce again, and then the cubs will move on and live by themselves. Some Canadian Lynx Females will give birth at 1 year old but there birth rate is normally lower than a older female. Prey population is a high linking to the birthrate of of the cubs. The lower the Population of Snowshoe Hare the less the birthrate of the Lynx. 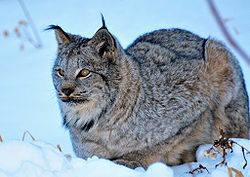 The Canadian lynx population density and migration are linked to the Snowshoe Hare and the Southern Snowshoe Hare, because they are there primary source of food. The Southern Snowshoe Hare allows the Canadian Lynx to be distributed through Montana. The Canadian Lynx in Montana is twice the size in population of those found in the north. The Canadian Lynx tend to settle down in habitats with sub-alpine forests. There other Habitat is Engleman Spruce and Douglas fir. The Canadian Lynx avoids large openings. When they are reproducing or just inactive they stay in hollowed trees or stumps. They will switch to Red squirrels as a side food or when the Snowshoe Hair reduces in population. They like to feed on other animals like different types of squirrels, Porcupines, and beavers. Lynx are more loan species. They tend to do better than other predators and animals because of there big paws in the regions they live in because of the high snow. It is still up in the air and not proven yet weather or not this species is endangered or not. They are a protected species in Wisconsin. There are some areas with more Canadian lynx than others and some places were there is none at all. BigCats Online Andrew Garman, Bigcats online. Canadian Lynx Bear Country USA,TDG Communications, 2008. Candian Lynx Feild Guied Mt.Gov. This page was last modified on 12 March 2012, at 00:47.